Last Thursday Meteor CEO Fergus Finlay and actress and Barnardos Ambassador Sarah Bolger launched the Meteor Christmas text appeal for children's charity Barnardos. This is the first time that this type of appeal has been run between the two organisations although they have shared a strong partnership for the past number of years. Through simple texting, Meteor customers can donate directly to the charity. Meteor customers just text ‘Barnardos’ to 57502. These texts cost the customer €2 and every cent goes directly to the charity. For the appeal Meteor are waving all costs. The text activity is also being supported with a range of other fundraising activities taking place over the next couple of weeks by Meteor staff. These will include a collection day in Connolly station, volunteering at Barnardos Christmas project parties and the ‘Give a Gift Campaign’ where staff members buy gifts for Barnardos to distribute to children this Christmas. 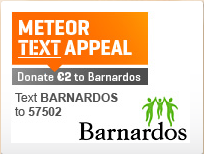 The Meteor Barnardos text appeal is fully live and available to all Meteor customers.